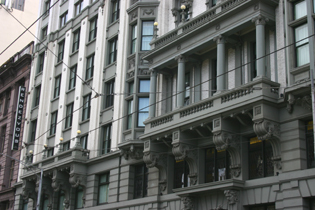 The Rendezvous Hotel Melbourne is a 4.5 star grand historic hotel opposite Flinders Street Station. It was built in 1913 and is now a restored heritage listed hotel with modern facilities. It has the best of both worlds. It is overlooking the Yarra River and is located right in the heart of the city. It prides itself with excellent service, elegance and style and is the choice of many business travellers with a high performance lifestyle, locking for a hassle free travel experience. The hotel features 340 stylish guest rooms and suites, each individually designed. You can choose between Deluxe, Commerce, or Club Rooms and One Bedroom Suites, each with modern design, white linen, full-length mirror, seating area and executive desk. The Rendezvous Melbourne was the winner of Australian Hotels Association Victoria State Awards for Excellence 2010. For secure bookings and guaranteed best prices, you can book the Rendezvours Hotel here - No Reservation Fees! The Rendezvous has a grill restaurant serving modern Australian cuisine with an Asian influence and good wine, a bar for classic cocktails and champagne, and offers room service 24/7. The reception desk is also open 24/7, so really you get all you need with a great hotel. It has a business centre, conference centre and caters for weddings. Flinders Street Station is right at the doorstep, so is the tram network and the free City Circle Tram. It is walking distance to pretty much anything within the CBD and Southbank. I would recommend breakfast in one of the nearby Melbourne lanes!